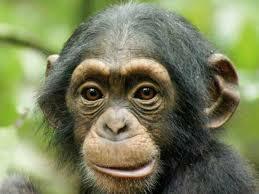 Today I want to write about our closest living relative, the chimpanzee. These amazing animals grow up to 1.2 metres tall. Their arms grow longer than their legs, which helps them to walk along by clenching their fists and putting their weight on their knuckles. Even though they are smaller than us, they are much stronger than people. Chimpanzees live in groups of 15-150 animals. These groups are made up of males and females and have a strict hierarchy. They stay in the same groups for their entire lives. They mainly eat fruit, but also eat leaves, flowers and occasionally insects. Some groups of chimpanzees have also learned how to hunt for monkeys. They cooperate as a group through calls to surround the monkeys in the treetops before killing them and eating the meat. They are very intelligent and use a range of tools, including sticks to fish out termites and ants, and rocks to open nuts. Chimpanzees are found in the forests of western and central Africa. They are considered endangered due to habitat loss and hunting. Are there any other interesting facts that you would like to share about chimpanzees?